The Homelife Care Medical Alert System is on call 24/7, giving caregivers peace of mind and seniors the confidence to live independently. Homelife Care provides everything families need to feel as comforted as seniors feel independent. Homelife Care is easy to use. We'll even set it up and teach you and your loved one how to use it. Push a button, pull a cord, use voice commands or even let your fall detection pendant call for you. Schedule medication reminders and stay updated with notifications if your loved one calls for help. A free cellular connection keeps the Hub reliably online-no internet or phone line needed. If there's an emergency, we're on it. Our call center will reach out to make sure you're ok and send emergency service if you need it. See how it works in our video. Professional installation and in-home training included--no additional cost, no long-term contract. *One-time equipment charges of $50, which can be spread across 4 months for payment. Additional devices can be purchased separately. Our devices work together to put your mind at ease and your loved one in control. The Hub connects seniors to trained care professionals anytime, any day. If someone falls, it automatically calls for professional help and alerts family through the app. In an emergency, seniors can call a trained expert just by saying, "call 911". Get an alert the second help is called, then stay in the loop with notifications sent straight to your phone. 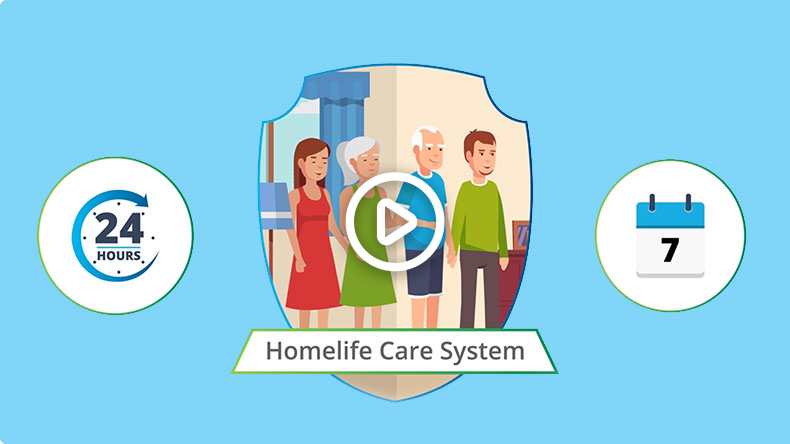 What is included in your Homelife Care system? The Homelife Care Medical Alert System base equipment kit includes a Hub and an Automatic Fall Detection Pendant. The Hub and Pendant allow you to call for assistance any time you need help by pressing the emergency call button. The Automatic Fall Detection Pendant is a device that automatically detects falls. You can also press the emergency button on the Automatic Fall Detection Pendant for help. You also have the option to buy a Voice Enabled Device. This device allows you to call for assistance by pressing the emergency button, pulling a cord, or saying the emergency call phrase, "call 911", three times. The Homelife Care Family mobile app is included for up to 4 users with each subscription, and is provided to the subscriber's caregiver and/or family members. How does the service work (cellular, WiFi, Zigbee like Homelife)? The Hub is a cellular device which directly calls the Emergency Monitoring Call Center when activated during an emergency. Automatic Fall Detection Pendant and Voice Enabled Devices connect to the Hub using radio frequency (RF). What is the battery life for all of the devices? Hub– 24 hours of emergency power (battery is rechargeable; therefore, no defined battery life). If the battery goes dead, a notification is sent to the caregiver and our team. A technician is then dispatched to replace the battery. NOTE: You can find details on battery levels within the Homelife Care Family App. What is the range of each device? Automatic Fall Detection Pendant: 600 feet from the Hub (in ideal conditions). Thick concrete and steel walls may limit coverage. Voice Enabled Device: Up to 30 feet. The range depends on the volume of your voice and level of background noice. If the power goes out, the Hub works on battery backup for 24 hours. The Hub battery is a lithium rechargeable battery which needs to be charged. Batteries may not be exchanged for a new battery in Cox retail stores or our warehouse. If a battery goes dead, a technician will be dispatched to replace it (an incorrect replacement could damage equipment, so it's important that the battery is professionally replaced). IMPORTANT: If a senior loses power for more than 24 hours, it's important that they contact 911 for emergency services. Can I pay for my loved one's service? Absolutely. the caregiver may choose to pay for the service on behalf of the user, as long as the user is a Cox customer and lives in the Oklahoma City service area. How many caregivers can be on one account? A maximum of 4 caregivers. Not sure how to talk to your loved ones about a medical alert system? We can help. Make home safe and simple for your loved one with Homelife Security and Automation. See product user guide (Spanish version). Or, fill in the form and a Cox Homelife Care specialist will contact you. The Hub is the brain of the Homelife Care system, connecting devices to care professionals and seniors to safety. Wearing a Pendant around the house means seniors can always get help, anywhere at home. Need help? Just the say the word. The Voice Enabled Device is not included in the Homelife Care base kit. Add device for $59.99 each.